Mint Raita/Pudina Raita brings in refreshing flavours when you relish it with your Tikka, Kabab, Paratha and Pulao. Mint is good for health as it is a great appetizer and promotes digestion. 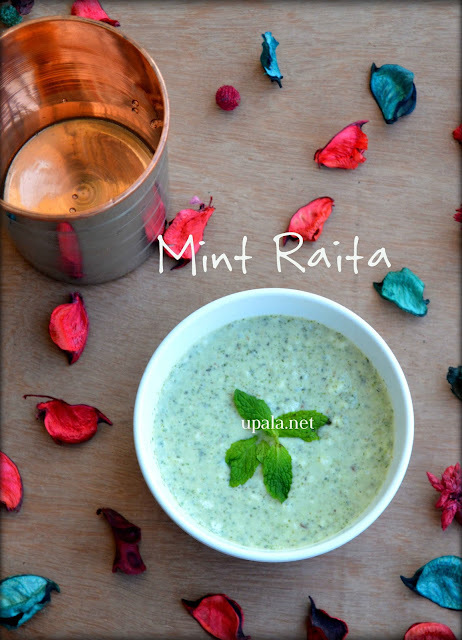 Mint raita is one of my favorite and similar to this another raita I loved the most is Brahmi Raita which is full of medicinal value. Isn't it correct? if I quote, "Raita's are a delicious way of enjoying the veggies or greens without losing much of its nutritional value". True, and especially when the sun is scorching you with its heat waves, Raita's help your body to cool down. The most popular raita of my blog is Mixed Veg pomegranate raita and it is indeed super delicious. Have you tried my Strawberry raita? Give it a try and see how it tastes. Other raitas include Capsicum Raita, Banana stem Raita, Bhindi Raita, Amla Raita, Onion Raita, Cucumber Raita which are easy to make and healthy as well. 1) Heat a kadai and dry roast the cumin seeds in medium flame until fragrant and they turn colour from brown to light dark brown. Cumin seeds might get burnt easily to keep a close watch on then, once you notice one seed start fragrant try stirring continuously to avoid getting burnt. 2) Once done, transfer the roasted cumin seeds to a bowl and leave it cool down for few minutes. 3) Grind the roasted cumin seeds along with green chili and mint leaves to a coarse mixture. 4) Add 2 tablespoons of curd and grind again to get a semi fine paste. 5) Now, take the remaining curd in a bowl add sugar and salt to it. Whisk them once, add the ground paste to the curd and whisk again. 1) You can even add a pinch of chat masala to get an enhanced flavour. 2) If you have already made roasted cumin powder then it saves the work of roasting it now. 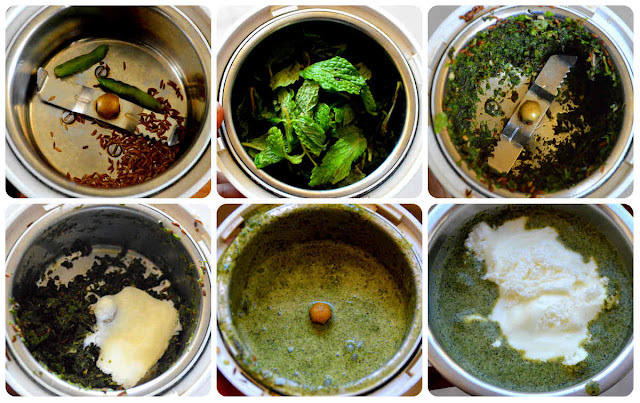 Just add the powder directly to raita and grind only green chillies and mint leaves. 3) Instead of green chillies, you can even add red chilli powder. 4) Use thick curd so that your raita turns out to be thick as well.